Hearing of another price cut, I contact Bertrand Vogele, CEO of Yachting Partners International, who confirms a €1.1 million drop in the price of the 42.67m sailing yacht Senso One. Launched as Mari-Cha IV by France's JMV Industries in 2003, she was designed by Philippe Briand and built to be the world's most cutting-edge racing schooner with the specific intention of winning the Charlie Barr transatlantic record for a monohull. In October 2003 she set off on her record-breaking attempt and succeeded in smashing the previous best time of 8 days with a new record of 6 days, 17 hours and 52 minutes. Senso One remains to this day the undisputed fastest monohull in her class, capable of speeds over 40 knots and a range of over 500 nautical miles in 24 hours. 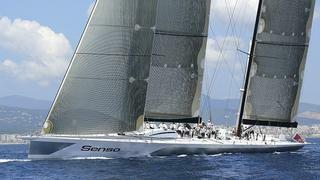 Available for sea trials in Imperia, Senso One is down from €4.4 million to €3.3 million.